As a blog reader myself, I have experienced situations where I left a comment in a blog only to realize I made a spelling or factual mistake after submitting it. Whenever that happens, the only way I can correct my mistake is to submit another comment with the corrections or to contact the blog owner. By default, most blogging platforms including WordPress does not allow a reader to edit their comments after submitting it. However, that can be changed by installing the WP Ajax Edit Comments plugin. With this plugin, the author and reader can edit comments on the post directly. The blog admin may set the amount of time a reader may edit their own comment. The reader can edit their name, blog URL and comment within this time frame. The time left will be displayed as a countdown timer. Any plugin that posts comments via Ajax and doesn’t require a page reload. An example plugin is JQuery Ajax Comments. Any plugin that loads jQuery improperly without queuing it with WordPress. Does Buy Me A Beer Plugin Works? I’ve seen some bloggers using the Buy Me a Beer plugin. I was tempted to give it a try but I wasn’t sure if it will work for me. I guess it works best for blogs with good content and high number of visitors (which I don’t have). I stumbled upon JohnCow’s post on how he has over 5,000 unique visitors a day after 14 days but has only 3 people donated through the plugin (albeit he hacked it to donate milk instead of beer, I think it should be the same plugin). Will it work for my blog? Have you tried it and is it worth the try? For those not familiar with Buy Me A Beer plugin, it is a plugin that enables the blogger to request for donations through PayPal from their readers. It’s also an easy way for the readers to say “Thank You” to the blogger for any information on the blog that has somehow helped them in anyways. I found the video How I Made ~$25,000 Under 1 Minute from AhPek’s post on How anyone can make $25,000 or more from Adsense in less than a minute. The video demonstrates how anyone can edit the amount in the adsense report with photoshop. That is possible but does require some tweaking and patience. If you are not familiar with photoshop, it may take a lot longer to do it. When that is done, you are able to edit the text on the screen like how you would in a normal text editor. Once you are done, insert the line of code below into the URL location box and hit the [enter] key again. This will deactivate the “modify” function and the adsense report page will function like normal. To remove all traces of all tweaking done, click on the URL location box and hit the [Esc] key. Next, click anywhere on the screen. Below is a video demonstrating how it’s done. It can be done in under 30 seconds. The last time I heard, Nuffnang hired a “specialist” to handle their occasional slow loading ads. The investment must have paid off when they finally found a solution to that problem. Therefore, the ads do not influence the loading time of the blog anymore. Apart from that, I have just noticed that they added a new feature in the admin menus. Previously when a publisher is not served any ads, their default ads (skyscraper) such as the one below will appear. All you need to do is to login to your account and click on the “Add Ads” menu. There will be a “When there are no Cost Per Unique Visitor Campaigns, show:” text with a dropdownlist on the right. Select the option you want and click on the “Save” button. 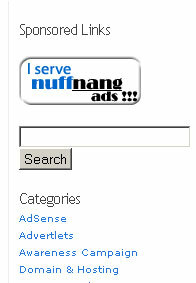 When you select the “Minimize Ads” option, the space taken for the ad will be greatly reduced and a new button with the text “I serve nuffnang ads !! !” will appear. 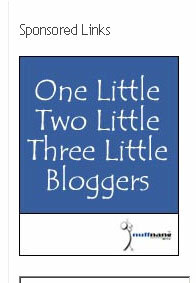 I guess you cannot completely hide the banner since potential advertisers need to know where the ads will be place when they visit your blog. I do notice a disadvantage of “minimizing” your banner ads — you don’t get a referral link when someone clicks on the banner and signs up with Nuffnang. Anyway, I don’t really mind it at all. Since I only have a skyscraper banner in my blog, I do not know how the leaderboard and large rectangle banners will look like when they are “minimized”. Maybe you can try it out and drop me a link in the comments area for me to have a look. Thanks in advance! Online Advertising Killer — another uprising Malaysian advertising website? Online Advertising Killer is a newly launched website. It started operation mid April 2007. Currently, it has slightly over 10,000 registered members. Not bad for a new company. The website is available in 3 major languages — English, Mandarin and Bahasa Malaysia. Here’s a sampel of their advertisement. The advertisement will be accompanied by two (or more) questions. The answers can be found from the advertisement itself. This is to ensure that the members look through the advertisment. Online Advertising Killer’s form of advertising is different compared to other advertising companies like Google Adsense and Nuffnang. With Nuffnang, the advertisement is displayed to a group of readers. Meanwhile with Online Advertising Killer, the advertisement is only displayed to the member. Therefore, the potential buyer for an advertisement at Online Advertising Killer is only the member him/herself. I don’t think Online Advertising Killer will make it big (I may be wrong). The main reason is that people who joined this program are looking for money, not to spend money. For example, what’s the point (for the member) to earn RM1 for an advertisement but end up paying RM10 for a set meal advertised by KFC? That way, the more advertisements the member views, the more he/she loses. If you’re thinking that the members will only view the advertisements but will not purchase the products or services advertised, then why should an advertiser even bother to advertise? These are just my views. Mind to share yours?